I am a week late to the conversation, seeing as how most of the reviews and articles about a movie show up a day or two after its release. I watched Crazy Rich Asians a few days ago, with my good friend and her sister, because it felt like that type of movie, the social kind that you turn to the person beside you to quip about. I wanted to like it, I really did. After all, I wrote a post charting my high expectations for said movie. While there were funny bits, what makes me sad is that the movie doesn’t do much of what everyone is claiming it does. Let me explain. I have always wanted to go to New York, mainly because of how it is depicted in movies. The New Year’s Eve party in When Harry Met Sally, the ice skating rink reunion in Serendipity … it seemed like the perfect backdrop to falling in love. I wanted that for Singapore, but the Singapore that I saw on that screen was just trying a bit too hard. The main images of Singapore are centered around Marina Bay Sands (MBS), the wedding in the movie is in Gardens by the Bay; we never get a better glimpse of what Singapore is like beyond those places. Yes they are rich, but rich people have other places they hang out, like the Singapore Island Country Club, which has the most expensive golf course and country club membership. It seems that the part of the country who lives in flats are also forgotten, since everyone lives in landed property in the movie. Even Rachel’s friend Peik Lin, who studied with her in the US, is also rich. There is also the meme going around about the scene where they exclaim that Newton Circus has the best satay on the island, when we all know that’s not exactly true. Perhaps that’s the joke, that the scene is rich people playing at being the local, a performance rather than something authentic, though it didn’t really play out that way. The backdrop comes across as an advertising campaign organized by the Singapore Tourism Board, instead of the viewers getting to see what the real Singapore is like, as opposed to just one tenth of it. I nearly laughed out loud when I saw the meal being prepared for that whole flower blooming party. All the cuisine so authentically Asian, so Singaporean. I assure you we don’t eat like that all the time. Michelle Yeoh plays the ever concerned and fretting Asian mother, commenting on her son’s weight loss, then proceeding to bark out orders for an herbal soup to be brewed. She’s concerned but she’s also rich, so let the help cook the broth for her son; it’s not like they have a dinner to prepare for. Then we get the cherry on top of the cake, the dumpling making scene. How Chinese, how Asian we all look, making dumplings, because we are a people of traditions and traditions should not be forgotten. And did the pivotal game scene have to use majong? It’s like they pulled up google and looked up the most Chinese game in the world. Yes, I know it is a metaphor, but I honestly couldn’t get behind Rachel’s inane nonsense about how whatever future Nick would have, it was because of her. There has been a lot of reaction about the treatment of the Asian minorities in the movie, namely the scene where Awkwafina and Constance Wu drive up to the Young residence, and two Sikh guards show up beside the car. I laughed at the overreaction from the women, but then started feeling a little sick inside when one of them said “Don’t hurt me.” Even the way it was staged with them sliding up the side of the car, as if emerging from the jungle that surrounds the property, presented as the primitive beings they are viewed to be. Believe me, I should be used to such a reaction by now. I can cite numerous examples of adults hiding their children from me, and young kids pointing at me and calling me “apu neh neh”; the racial other in a sea of Chinese individuals. I am disappointed that in trying to play up their representation, it required a cheap shot at another Asian group. Amid all my disappointment in the representation, I was hoping that the love story would salvage the movie in some sense. Alas, the limp characterizations and lackluster acting dashed any hope of that possibility. Henry Golding as Nick Young is handsome, and he has a nice body. That’s pretty much it. There is no display of his personality or who he is, apart from being rich and handsome. Is that all he has to offer? We have Rachel’s traits consistently highlighted to us, but I know next to nothing about her counterpart, other than the fact that he’s like “the Asian bachelor”. Even the supporting relationships are so superficial. I couldn’t tell you why Colin and Araminta are getting married, or why on earth Rachel cried during the wedding. What was so touching about that ceremony? There is no vows or any sort of sentimental display, all we have is a bride walking down an aisle filled with water, which is so absurd I am guessing it was a way to poke fun at the rich. My issue is that those moments never play out as satirical, and I can bet you that people probably come away from it thinking that’s the kind of wedding they should have, when it sounds like a humid nightmare to get married around the amount of plants and water. Astrid and Michael were my last hope, and that flamed out as well. Once again, we get the display of the oriental male body, a glimpse of our very own Pierre Png in the shower and sporting abs. That’s all we ever get. Much like Nick’s character, there is nothing beneath the surface. We learn briefly that he had a military past, but that’s about it. Where is the love story? I don’t get how these two people ended up together, besides the fact that they are attractive. Michael cheats as a way to regain his masculinity, because his wife emasculates him with her wealth and numerous achievements. We are supposed to side with Astrid and villainize him, because how could he cheat on her when she is beautiful and rich? I am guilty of asserting this to my friend during the movie, mainly because we are supposed to view her with this rose-colored sense of perfection. When they break up, she goes to where she hid her million dollar earrings and wears it, because now she has gotten rid of the baggage that was holding her back from being who she truly is. She calls him a coward, of not being a man, and we cheer with her, because girl power, instead of seeing the reason of why he cheats. What makes Pride and Prejudice such a powerful love story, is that we see our leads changing, adapting, in order to be better for each other. Darcy has his arrogance, which is a result of his social class. He insults Lizzie unwittingly during their first meeting, and adds salt to the wound when he explains how he tried to stamp down his feelings because of how poorly her family comes across. Nick, in comparison, is a blank slate. He has no pretensions, and doesn’t even view his family’s money as his own. While Darcy stepped up and took great care of the estate of Pemberley and his little sister, what is Nick taking care of? There is no sense of obligation, just a desire to run off and be with Rachel in America. Darcy helped Lizzie deal with the scandal facing her family, and didn’t even take credit. Nick doesn’t even help Rachel navigate the shark infested waters of his world. She is lucky she has Peik Lin and Oliver to help dress her, and prevent her from being embarrassed. Couldn’t he have brought her shopping? Or have Astrid bring her? He claims to love her so much but just continues to leave her in the lurch over and over again. Rachel fares slightly better as a character, as we are told over and over again that she is an Economics professor, that she is smart, beautiful, self-made woman. But, do we really see this? Her strategic moves involve wearing a pretty dress and sitting beside some princess who wanted the whole row to herself. The poker and majong scenes don’t come across as particularly impressive. Lizzie, on the other hand, is naturally witty and I love her banter with Darcy as well as her observations about society. So at the end of Pride and Prejudice, the happy ending is earned, because of the strong characterization. In comparison, I felt nothing with the airplane proposal or the engagement party that followed, which was once again at MBS, and the must-have addition of synchronized swimmers in the infinity pool. I know I am supposed to feel triumphant that Rachel gets the hot, rich guy, that she overcomes the prejudice of her upbringing and background, but does it feel like a prize when all she gets is entry to a world with flat, unlikable people? Fitzgerald, in his novel The Great Gatsby, comments on the carelessness of the rich, the pointless, drifting lives they lead and the spiritual void they exist in. We lose that in Crazy Rich Asians, where there is no biting social commentary but rather, the worship of the rich, where there is no struggle, no loss … where there exists the kind of Asian representation I don’t want to be part of. Thanks for reading! 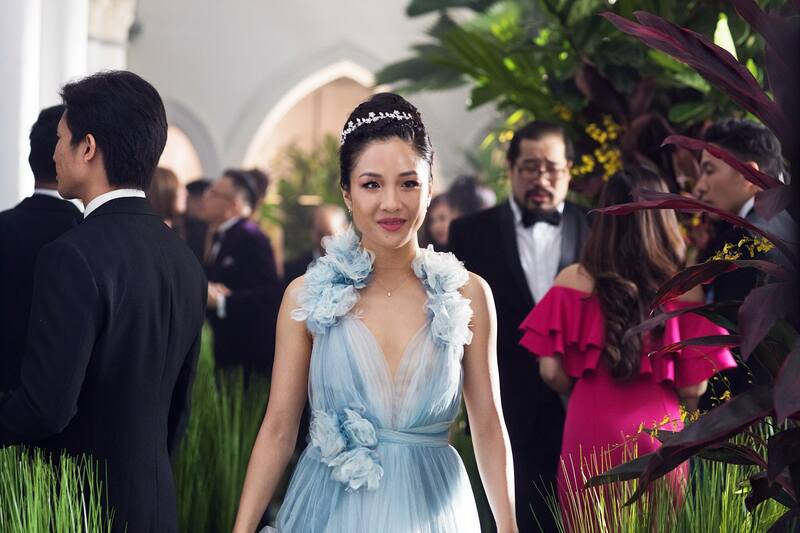 What are your thoughts on Crazy Rich Asians? Comment down below! Tags: asianAwkwafinaconstance wucrazy rich asiansEntertainmentFilmFunLoveMovieBabbleMoviesOpinionRomanceRomCom MoviesWarner Bros. Saw it tonight and was equally disappointed. Oh dear! I hope it wasn’t my influence haha. What were you disappointed about? I didn’t find it that funny and I thought some of the characters were pretty weak. I think it’s less about the genuineness of Singapore and more about the culture divide between Asian Americans and an older generation of Asians. Hi! Thanks for the comment 🙂 I think that setting is very important in a movie, and in this case, the setting is Singapore. The identity of the Young family is tied heavily to the blossoming of the island and our gradual movement to independence, which Peik Lin explains to Rachel in one of the scenes. They are practically Singapore royalty, so yes, I think that plays a huge part in the presentation of the movie. On the surface, it might have seemed that Eleanor’s gripe with Rachel was because she wasn’t authentically asian and grew up as an American, but really, it is more of the result of Rachel’s social status. She brings nothing to the table, not to mention the scandal in her family history that might have come across less insidious if she didn’t appear to be hiding it. This is why I compared it to Pride and Prejudice, because that is what it attempts to be, set against a different cultural backdrop. Haha! Have fun 🙂 It is an entertaining movie. Do check back in and let me know your thoughts once you do. I think its popularity and hype is due in part to its release at a very apt time. Representation in movies and in Hollywood has become a huge thing in recent years, and consistently talked about, especially after white actors keep getting cast in roles that are originally asian, like Scarlett Johansson for ‘Ghost in the Shell’.